...his face turns into this, for only the fortunate. If you're stupid enough to get really excited about the smile, and show such in a squeal or any other abnormal sound you might be right back at the bottom lip again in a split second. This is just one of the emotional adventures of a 3 month old. I have unfortunately pointed out the phenomenon to the other children and a favorite thing to do now is see if they can freak him out enough to cry. I know. Not cool. So I've been trying to encourage his other tricks. Like holding stuff. He will give you a huh?-look when you put something in his hand, and think about it very intently. About five minutes later , since he doesn't know how to let go of the object, it occurs to him to look down at the noise that thing in his hand is making and then hit himself in the head with it a few times. Then we're back to where we started with the evil siblings trying to give him objects that he'll hit himself in the head with (I should state that its mostly just one or two of them, who shall remain nameless, that do this, while the others come to Roman's rescue before things get out of hand). It's all just a lot of silly fun, and he has no idea that he is the only human on earth who can get such laughs out of his siblings. Belly-aching, falling over, rolling in the floor, tears in the eyes laughs. All because he hits himself in the head with a rattle. He's a comedic genius. Oh- and the quilt-in case someone asks-just nine log cabin blocks made into a square quilt, about 38x38", made with Good Folks when I was pregnant. We use it as a floor quilt for him all over the house. Now that he's rolling over, he LOVES sitting up on his forearms and having a good look at the prints. I should have gotten a picture of that too, but I think I've indulged plenty today! My little one will be 3 months on the 21st! Such fun they are at this age. She too does the marching band all limbs going at one time thing. I love it! Its amazing how quickly they change and grow! I'm thinking I need to get my hands on a stack of that beautiful fabric too!! he's growing so so fast! 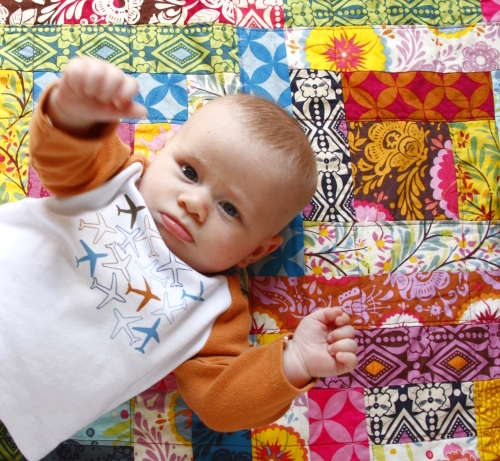 Beautiful boy, beautiful quilt. I can't believe how much they change in just 3 short months! Oh emotion regulation -- you're such a tricky thing to master! It sounds like he'll have a lot of practice with it thanks to his helpful siblings! 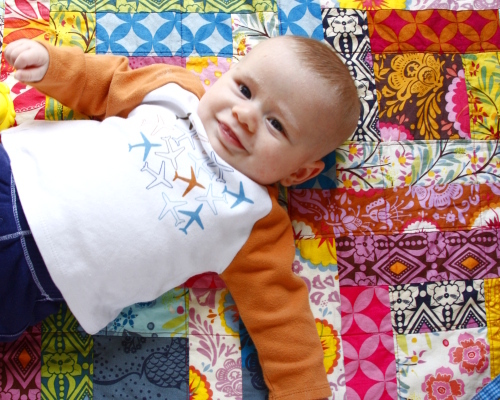 The words, the baby, the emotions, the quilt, the prints... all good fun. hahahah this is the cutest thing ever. How long did it take you to make your quilt? I love babies. Thanks for the trip down a sort of memory lane for us moms without little shavers. 3 months already?! Holy cow how the time flies! Love the quilt. Love the baby pictures. Please keep both coming! Does that marching band thing ever remind you of Bill Cosby in "Himself"? Y'know, the part where he talks about the poopy? Used to crack me up. Our youngest is now 11 months, and when he was doing all the stuff Roman is up to now I never imagined he'd really pull up and want to walk. Seems so much longer ago now! Good to be reminded by your little cutie. What a doll. And a lucky one to be laying on a gorgeous quilt. Oh, Anna. He is adorable. And he's grown so much! Even though I've had three now, it still amazes me how quickly they grow and change. You caught such lovely pictures of him here. I love his little lower lip. My daughter (now almost 16 months) still bursts into tears when surprised. She's quite shy and sensitive, which is actually a refreshing change when comparing her to one of her brothers who will disappear with just about anyone and talks happily to too many people sometimes. SCARY! Enjoy the time that flies from month three to month four. AM I loved this post. Mainly I loved the pictures in this post. 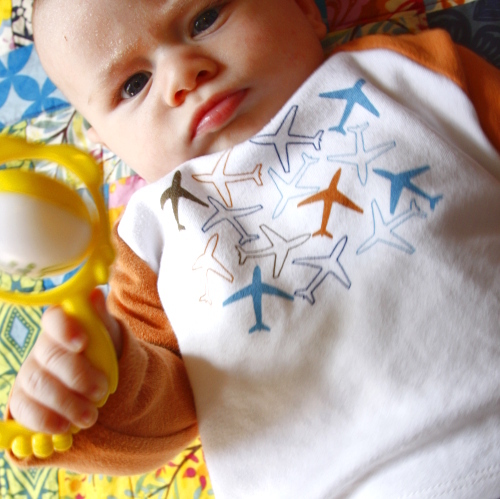 The cute lip, the darling airplane shirt, the gorgeous quilt and the gotta-nibble-them cute curled toes. Hi Slop Queen- I can't remember how long the whole process took me, but log cabins come together quickly, though all the cutting is a bit of a bear....I think you could do it in a weekend. Thanks for reminding people to stop to enjoy kids being kids. I think sometimes we just get too busy and miss out on all the truly sweet stuff you so eloquently put into words and pictures. The world is lucky to have you blogging! Thank you! 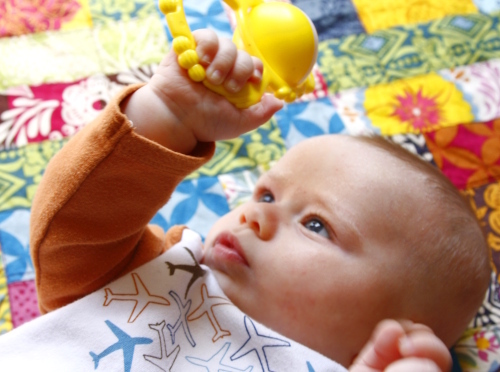 Baby quilts...the more the baby can look at the better. Love yours! Cutie beyond words! I don't know how you even find the time to post, between nibbling those irresistible fingers and toes. That quilt is the best! The quilt is almost as beautiful as your little boy. Thanks for sharing both! I think he just likes the quilt... and so do I!!! I adore this quilt, most quilts that I've seen are semi-old ladyish. Now I am dying to learn how to quilt so I can make Audrey Belle a quilt to play around on. Your work is beautiful! Wow, he is adorable (ding-dong!). Somehow he looks really grown up to me. His face looks closer to a toddler sort of face than a 3-month old sort of face. Slow down Roman! He is so cute, and looks adorable on that fabulous quilt. My favorite picture is the bottom one where his one foot is a little blurry, because he's probably moving it like crazy! Adorable!!! My four month old - instead of sticking out the lower lip, has a major lower lip and chin quiver. It is the cutest thing. So funny! I'll bet our little guys would have a lot of fun together! : ) And the quilt is lovely! I had to say: I love babies (I am a midwife and also have a 11 1/2 month old!) and now I love quilts!! Thanks for the gorgeous pictures, he's lovely! Blessings! Yikes...makes me want to squeeze him through the computer. Just adorable! The quilt is cool too. Love the quilt, but he baby is to die for cute!!! precious boy, precious siblings, precious quilt, precious mama! Thanks for a morning delight. he's such a handsome BOY. you how with some babies, you don't know if they're boys or girls? well, he's a real boy. He is such a cutie! Love that bottom lip thing he's got going on! Three months! Oh my. One of hte best ages. Little personality shining right through. Oh - the quilt is cute too! 3 months !!!! I can't believe it !!! He's so cute ! Too cute. He has no idea how lucky he is with so many adoring (and teasing) siblings! Your mum is a funny lady who makes stunning quilts for you to enjoy. You almost make my forty year old body want to have one more baby. I love all the faces but my favorite is the hitting himself on the head. My second was so cute when she cried sometimes I would just want to watch for a second because it was so stinking cute to see her face all screwed up that way. The bottom lip thing is hysterical! My little girl came out of the womb with a bottom lip. We have a great photo of her and the bottom lip when she was 4 weeks old. Probably protesting because I was taking too many photos of her. Anyways, enjoy your little boy, he is GORGEOUS! As the very youngest of 5, I totally sympathize with Roman! He has a great bottom lip face, and I think the pinwheeling arms and legs has to be one of the cutest baby things ever. Love the quilt -- very sweet. Both of my girls were born with that lower lip! One still has it, the other (as she told my mom a few weeks ago) has reverted to puppy dog eyes. Love Roman and the quilt. Funny story. The torturing/nurturing schizophrenia by the sibs is classic and starts so early. So cute!!!! I just love, love, love your page. You sound young and hopeful and everytime I read your page I feel as if I take in a fresh breath of air. I love reading about your creative side and espy adore the stories and pictures of your family. I have children similar age to yours. But just look at those toes when he is doing his elliptical thing - the cutest! Really nice pictures of your wonderful little one! Too cute! and thanks for the inspiration I have been waiting for worthy of cutting up my perfect stack of Good Folks that are itching to be stitched! I am a new convert to your books and patterns and quite a new crafter - I am also a mummy of a 3 and a half year old and a 2 and a bit year old - and I just have to ask - how do you do it? Your business, your design, your gorgeous blog and your very very cute kids - you are quite inspirational - just thought you should know! And quilt is lovely too. Anna Maria, I love your work! He's starting to look like a little man! My fiance was 12 and another brother 10 when their Baby Brother was born, and what an indulged baby he was! Everyone loved him and spoiled him (in a good way)and I swear he's smiling in every picture I've ever seen him in. Forty some years later he's still always smiling!! Must have been all that sibling attention. Love him and the quilt! :) I like the simple, log-cabin design and your designs on it makes it gorgeous. He's too cute! I totally relate to the sibling thing. . . when the twins were little the three older kids would do the same thing and think it was the funniest thing ever! The rattle to the head is a classic. Roman you are TOOOOO cute, buddy! Oh, and I like the quilt, too. Babies are so distracting. . .in a good way, of course! Ohmygoodness!! Thank you for the lovely post today. Mine is now 8.5 and you brought back such lovely memories for me. He is adorable! Oh Anna, he's adorable!! No other word for him.. I have just found your blog and was wondering where you find the time to do all you do? You wear me out just reading about it. Thanks for sharing your blog, its been a great read at the end of whats been a very testing day for me. love, love, love that quilt... and the true love that emanates from your observations of Roman. Adorable. And so is the quilt. Love that quilt! This is a hilarious post. Babies are so awesome and fun! Roman is adorable. And your quilt is lovely. Beautiful, beautiful fabrics! I see that everybody else already said it, but he really is super cute! And how lucky to be surrounded by all your wonderful fabric. Look at that bottom lip!!! The little man sure can pout. what a gorgeous baby shirt!!! and the quilt in the background is lovely too!!! He is so sweet, very precious! It is truly amazing how quickly they change. I enjoy watching him grow through your pictures! I am finding it hard to believe that our third little guy is already 1 month old...that went fast, too fast! That quilt is fabulous, I NEED to get over my fear of making quilts and just do it! Quel joli bébé sur une si jolie couverture!!! Wow - he's 3 months old already?! He is adorable!! 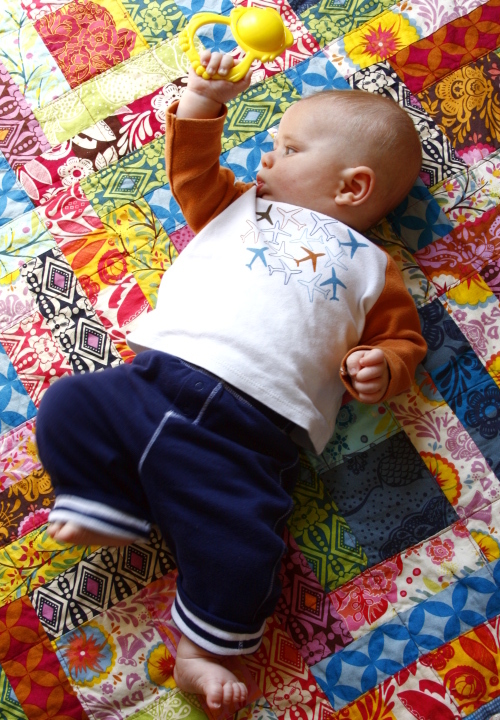 I also love the quilt - it makes me want to learn how to make one for my baby (due in January)!!! Loved reading this post - such a cutie pie! and saw VOILE... what's up with that??? How exciting!! Awww! My third is about to turn 6 months and I can hardly believe it! It's amazing how fast they grow, it seems time flies by quicker when there are already older kids. Phew. LOVE the quilt as well!! I'm sure he does too. I've never left a comment before but I love your blog and ALL your work! Roman is a cutie and I LOVE the little planes!! So handsome! And a gorgeous quilt, too! beautiful quilt and gorgeous boy!! Love the new pictures you got there! Please come visit my site Jewelry Store when you got time. Anna I must tell you I JUST LOVE YOUR BLOG....oh, and also all your fabrics, which, by the way I have most all of them now thanks to some intense searching online. You are such a talented gal and your children are beautiful...baby is adorable, but I am a grandma of soon to be 9 so I am very fond of little ones. Keep on creating the fab way that you do. Good tips that are worth checking and these tips are also worth suggesting to friends. Thanks for sharing. Great stuff! . I am new to seo, trying to visit more seo blogs for guides and tips. You can be friends with me. Please come visit my site fibromyalgia fatigue when you got time. Thanks. Awesome article, definitely liked the info provided. Just subscribed to your blog. Great stuff! . I am new to seo, trying to visit more seo blogs for guides and tips. You can be friends with me. Please visit my site hiv aids symptoms when you got time. Thanks. I am deeply in love with every single piece of information you post here. Will be back often to read more updates! Please come visit my site Garland Business Directory when you got time. some feedback Please come visit my site Bakersfield Yellow Page Business Directory when you got time. that your great job is clearly identifed. I was wondering if you offer any subscription to your RSS feeds as I would be very interested and can’t find any link to subscribe here. Please come visit my site Business Resources Comprehensive Listings when you got time. that your great job is clearly identifed. I was wondering if you offer any subscription to your RSS feeds as I would be very interested and can’t find any link to subscribe here. Please come visit my site Business Yellow Pages San Jose when you got time. Awesome article, definitely liked the info provided. Just subscribed to your blog. Great stuff! . I am new to seo, trying to visit more seo blogs for guides and tips. You can be friends with me. Please come visit my site Anaheim Business Directory Forum Blog Classifieds when you got time. Thanks. Awesome article, definitely liked the info provided. Just subscribed to your blog. Great stuff! . I am new to seo, trying to visit more seo blogs for guides and tips. You can be friends with me. Please come visit my site Anaheim Phone Book when you got time. Thanks. Hi Anna - I am new to quilting and sewing but already am a bit obsessed! Really enjoying your blog - can I ask, is this quilt a normal log cabin pattern that I could just follow or is it one that you came up with? I have just ordered the entire Good Folks series in fat quarters and would love to do this quilt. Me and my friend were arguing about an issue similar to this! Now I know that I was right. lol! Thanks for the information you post. Please come visit my site Stockton Business Phone Numbers when you got time. Me and my friend were arguing about an issue similar to this! Now I know that I was right. lol! Thanks for the information you post. Please come visit my site Free Business Listing of Stockton when you got time.